My Walgreens finally got the Halloween display up! Hallelujer. I was stalking Walgreens just waiting until they did, and praise Jeebus, they finally did. One of the girls who works at Walgreens is in my art theory class. And the other day she leaned over and said to me “I hope this isn’t creepy, but we just got a bunch of new Halloween nail polishes in. I know that’s your thing.” I’ve made it guys. She officially knows I’m nail polish crazy. I didn’t have the heart to tell her I had already found them. This collection also includes a solid black, and solid white cream, as well as the normal glow-in-the-dark top coat that they put out every year, but I didn’t pick these up, as I didn’t feel the need to. I have not been able to find ‘Deja Boo’ around at all (it seems to be a problem for others as well) – but if I happen to, I’ll be sure to update this post, as well as indicate in the title. Otherwise I have the other 8 shades here to show you! Now there are 9 colors (that aren’t the plain black & white), including the famous ‘Deja Boo’ promoted as this collection, so I picked those up, although there are more companion shades in the display with it. But I have swatches and a review of the main 8, as well as one dupe shade as well at the end of the post! 30 – ‘Courtney Orange’ is from what I know a re-promote. It’s low number tells me it’s part of the core line, and has just been promoted with this collection. Anyways, it’s a bright, metallic orange – like a fierce pumpkin. It covers nicely in 2 coats, or just one thicker coat, although in certain angles you can see the nail line through it. It’s a little thinner formula, so that means it just wants to run down the brush – wipe it off a couple times. As you can see it’s a little brush stroke-y as well. I surprisingly liked this color more than I thought I would. Next is 2122 – ‘Nice Guise’. This is labeled with a ‘Chameleon Color’ sticker. This is a blue jelly base with bright green glitters throughout. This is another that can be opaque in 1 thicker coat, but doing two gives more dimension as the shimmers layer on themselves. This is another thinner formula that runs down the brush. And since it is so pigmented, it can be a little messy during application. And upon removal, LEMME TELL YOU. I wore this one as a full manicure, and as I removed it, blue smurf fingers for dayz. You have to be super careful when removing this or it’ll just be everywhere. EVERYWHERE. (I also have a comparison of this polish with another one down below). 2123 – ‘Play Dead’ is a smokey silver metallic base with silver microshimmer and large red, metallic glitters. When I say smokey, I mean, it’s a darker more dimensional color than most normal silver metallics. Another that can be opaque in 1 thicker coat, or 2 thinner coats. This is such a beautiful smooth formula. Some metallics can be problem childs, but this just covered so easily. It does show a little brush strokes, but the red glitters help to cover that. They peek out enough that it looks so spooky. 2126 – ‘Cloak and Swagger’ is labeled as a ‘Tombstone Matte’. It’s a black, purpled toned texture polish, with purple shimmers throughout. This was 2 thinner coats to opaque. It does dry very textured – it feels almost like sandpaper, or like those plastic tombstone decorations you get at the Halloween store ergo ‘Tombstone Matte’, so you have to like textured polishes. And because it dries matte, you’ll have to use a good thick top coat to really make it shine like it does in the bottle. Spooky color for fall. 2180 – ‘Where Oh Werewolf’ is the Walgreens exclusive shade. It’s a light slate gray cream with silver microshimmer through it. Another thinner formula that wants to run down the brush. Another that is opaque in 1 thicker coat. I love this shade. It strays from the traditional gray shades you see, and the formula was very easy to work with. Now for the 3 Glow in the Dark toppers. I showed them all on their own instead of on top of other polishes to show what they truly look like. The first is ‘Hazel Moon’. It’s a blue-purple jelly base with super fine microshimmers, bigger round circle glitters and large moon glitters. This was 3 coats, and it still didn’t cover the nail so I suggest it as a topper, since the jelly base will get thick on the nail – I’ve seen it go well over blue shades. The moons were easy to apply – I didn’t have to do too much fishing besides swirling the brush around and easily placing them on. ‘Dead On’ is a light purple jelly base with black micro-glitters, holographic circle glitters and skull shapes. 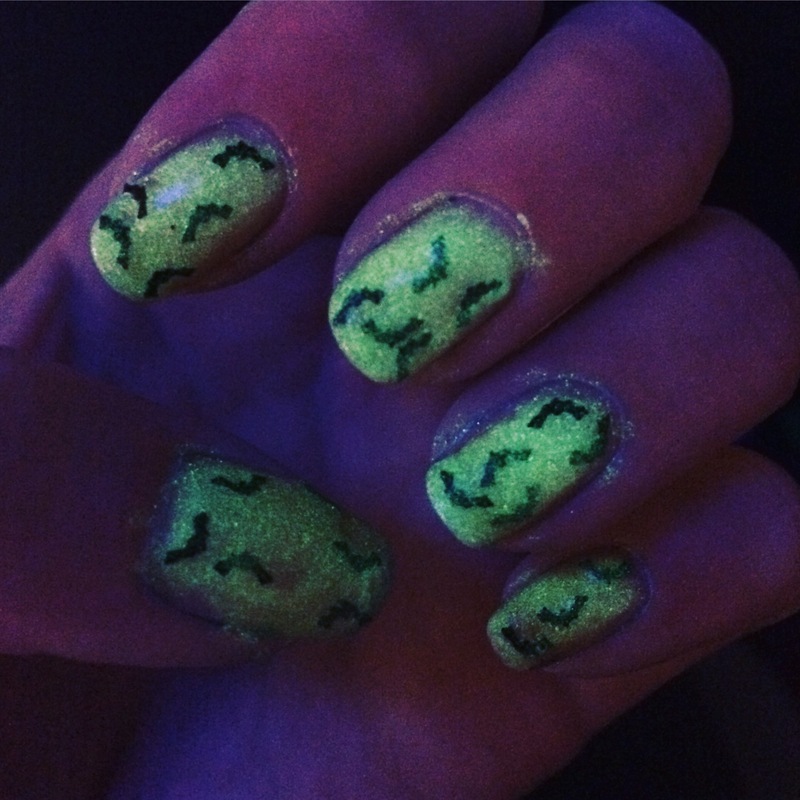 This is another glow in the dark shade. Again, use it as a topper as this is 3 coats and it’s not even close to opaque on the nail. The color of the purple base doesn’t show too much on the nail and just looks more pink. To obtain the skull pieces, as they tend to sink to the bottom (I picked this tip up from another nail enthusiast), I tipped my bottle upside down and rested it against a book to keep it up so the pieces would sink to the top of the bottle, and then grabbed them out. Not too bad, otherwise the glitters spread evenly across the nail. The last glow in the dark topper is ‘Got a Bat Attitude’. This is a milky jelly base (but thicker jelly than the other two, it reminds me of mucus in a bottle, sorry for that visual), with bat shapes all throughout it. Obviously another topper. The base seems to have like microshimmers, but matte, all throughout? It’s hard to explain, but you can see it in the glow-in-the-dark picture that it’s not just solid. To get as many bats as I did for this photo, I had to honestly swirl my brush around a lot, and fish for them. It did take some work to get more than 1 or 2 on each nail. I did a full manicure with this one, and by the time I had gotten enough pieces for each nail, I felt like I had already used a substantial amount of the bottle, because the base is so thick, which is a bummer (you can see this a little in the photo below). It was cool for a simple manicure, but also gave my nails a hard, plasticy-feel with some bumps thanks to the bats. I mean, I liked it, but I couldn’t stop feeling them. Here it is glowing in the dark. All of the others are about the same as this when glowing, with the larger shapes really showing in contrast to the plain base. Now, DUPE ALERT. I went to compare these two polishes, and upon having them on my fingers, it was so hard to tell any difference between them. So on my pinky and ring fingers are ‘Nice Guise’ from the Sinful Colors Halloween collection, and on my middle and pinky fingers is ‘Blue Ya!’ from the China Glaze Rebel Fall 2016 collection. If anything, if you look super close, the China Glaze has a tinge of a darker base, but it’s so close that I count it as a dupe. So if you didn’t pick up ‘Blue Ya!’ get ‘Nice Guise’ from this new collection! Overall, this collection has some fun toppers – though they were not my favorite things out of the collection. However, the solid colors, with all of the different finishes they came out with, were once again, as Sinful Colors does so well, so unique and a great addition to my collection. I had some surprise favorites for sure! I’m glad to hear that! As soon as I saw it I knew I had to. After I put them on I was trying so hard to find a difference and just couldn’t really! I just picked up today Nice Guise,Courtney Orange and the Glow In The Dark cover and they are awesome. Bought them at shop rite for 1.99 each. Love them. I love them all! They’re such cool colors. There were certainly some interesting polishes there. I really like “Nice Guise”! I agree! I think that’s one of my favorites from this collection!